In the last few months, Pearl Jam and Foo Fighters have been everywhere. Both groups are putting out career-spanning documentaries and are releasing a ton of new music in 2011. 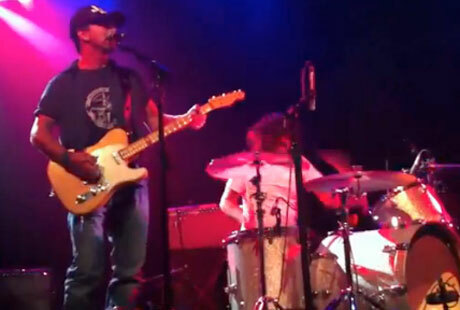 On Wednesday (April 27), frontmen Eddie Vedder and Dave Grohl, as well as one-time Nirvana guitarist Pat Smear, continued their quest for rock'n'roll ubiquity by showing up during Mike Watt's performance at Seattle's Triple Door. They start off with a version of Watt's "Big Train" before launching into a lengthy and chaotic take on the Stooges' "Fun House" (a track that was already lengthy and chaotic to begin with). See the collaborative performance below.